Conference of Presidents commends U.S. for vetoing Security Council resolution on Jerusalem. American Jewish Congress welcomes veto as well. Leaders of the Conference of Presidents of Major American Jewish Organizations on Monday commended the U.S. for vetoing what they described as “yet another ill-conceived and counterproductive resolution on Jerusalem” which sought to overrule President Donald Trump's recognition of Jerusalem as the capital of Israel. “The U.S. acted as a sovereign state in choosing where to locate its embassy. Unlike the outrageous stream of biased and condemnatory anti-Israel resolutions regularly adopted in the General Assembly, UNESCO, the Human Rights Council and other UN bodies, the U.S. decision on Jerusalem did not prejudge or seek to foreclose any outcome agreed to in negotiations between Israel and the Palestinians,” they added. “The proposed resolution was yet another ill-conceived attempt by the Palestinians to enlist the UN in their ongoing efforts to evade negotiations. It is time for the international community to stop abetting Palestinian attempts to use the UN to circumvent negotiations. 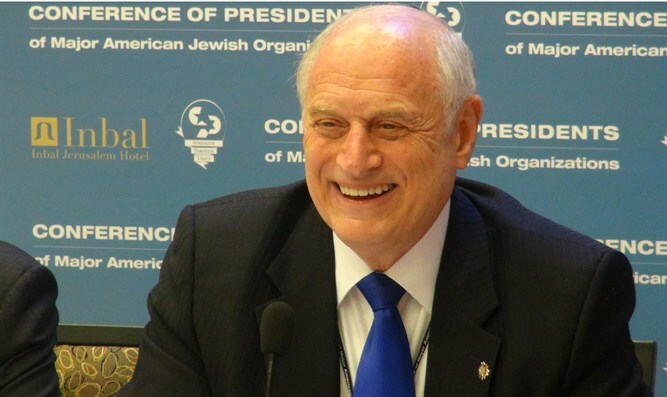 The Palestinians should present their grievances at the negotiating table,” said Greenberg and Hoenlein. The American Jewish Congress also welcomed the U.S. veto, saying the UN Security Resolution was “deeply divisive and one-sided”. “The U.S. administration has repeatedly stressed that its acknowledgement of Jerusalem’s rightful position at the heart of the Jewish State in no way prejudices final status negotiations. We are disappointed by this latest unilateral appeal to the UN Security Council, in this case by Egypt,” it said. The resolution which Washington vetoed had called on “all States to refrain from the establishment of diplomatic missions in the Holy City of Jerusalem" in order to prevent the fulfillment of President Trump's pledge to relocate the U.S. embassy from Tel Aviv to Jerusalem. 14 members of the Security Council supported the resolution, with only the United States in opposition. Prime Minister Binyamin Netanyahu praised Haley for vetoing the resolution. "Thank you, Ambassador Haley," Netanyahu wrote on his Twitter account. "On Hanukkah, you spoke like a Maccabi. You lit a candle of truth. You dispel the darkness [as they did]. One defeated the many. Truth defeated lies. Thank you, President Trump. Thank you, Nikki Haley." The Palestinian Authority, meanwhile, slammed the veto, with a spokesperson for chairman Mahmoud Abbas saying it was "unacceptable" and adding that it "threatens the stability of the international community because it disrespects it."